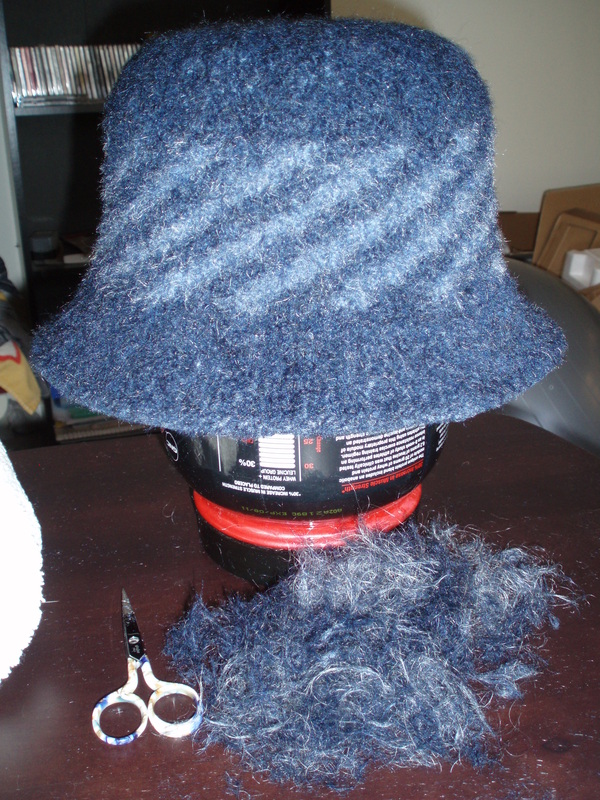 It seems that knitting a hat for myself is something I do every other year. 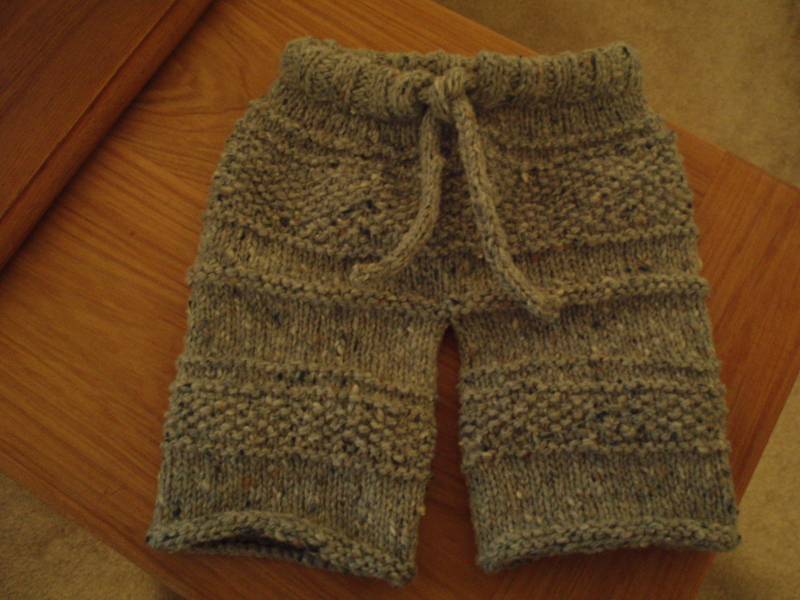 I knit them and it seems fine until I try them on. I think I look awful in all hats. I put the hats away and wear my hooded jackets more. I was looking through my yarn collection the other day and found a half knit hat. I know that this moved with me half knitted so it is at least 5 yrs old. 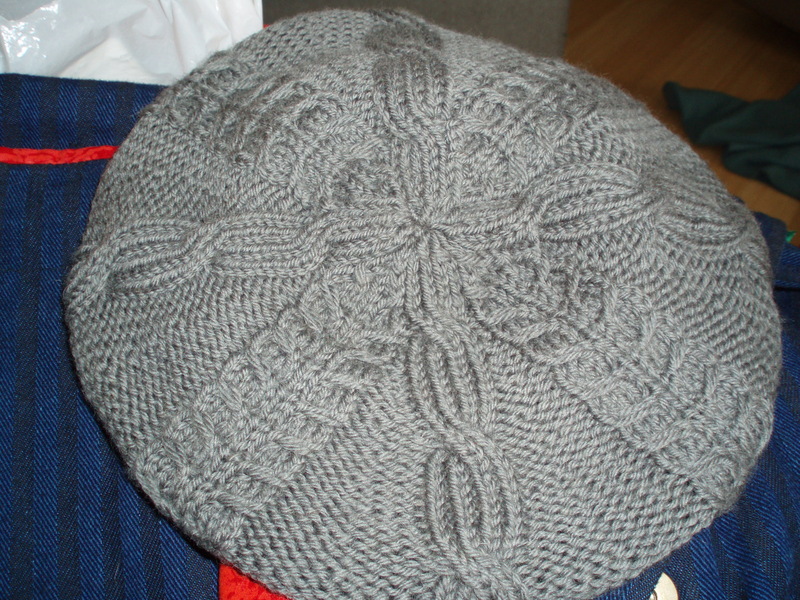 I vaguely recalled that it was a felted hat pattern but apparently 5 yrs ago I was an idiot and didn’t keep the pattern with the knitting. I couldn’t remember where the original pattern had come from so I went to ravelry, entered the yarn (I still had the ball bands) because I knew I was using the exact yarn that the pattern called. I remembered that it had been a pain to find as it was being discontinued at the time. It took me about 3 minutes to find the pattern. How lucky am I? If ravelry did not exist I would have had no chance of finding the pattern after so much time. I LOVE ravelry. 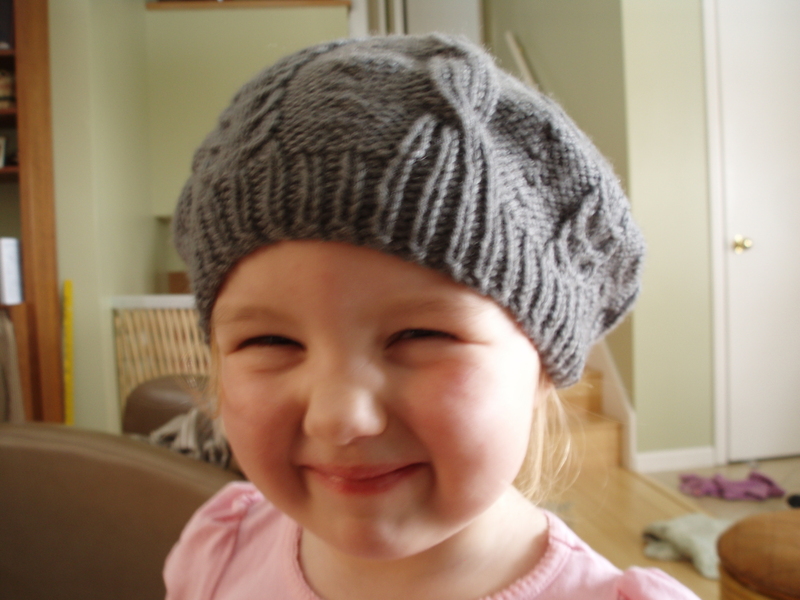 The pattern is the Classic Cloche from Knit One, Felt Too. I had to go to the library to pick up a copy of Knit One, Felt Too (the 2 copies in the knitting section were out but lucky for me they had a copy in the Young Adult section) but after that it was really quick knitting. After the first 2 trips through the washer on the hot cycle I thought the brim was too big and floppy. In my previous felting experience I have found felt to be moderately stretchable when wet so I sent it through again. It came out of the third washing a touch too small for my head. After a little digging I found in the recycling pile (on my kitchen table) a plastic bottle that was almost the exact size of the hat. I took a towel and folded it a couple times and put it over the bottle to make it bigger and then crammed the hat on it to dry. You may notice a “slight” halo. 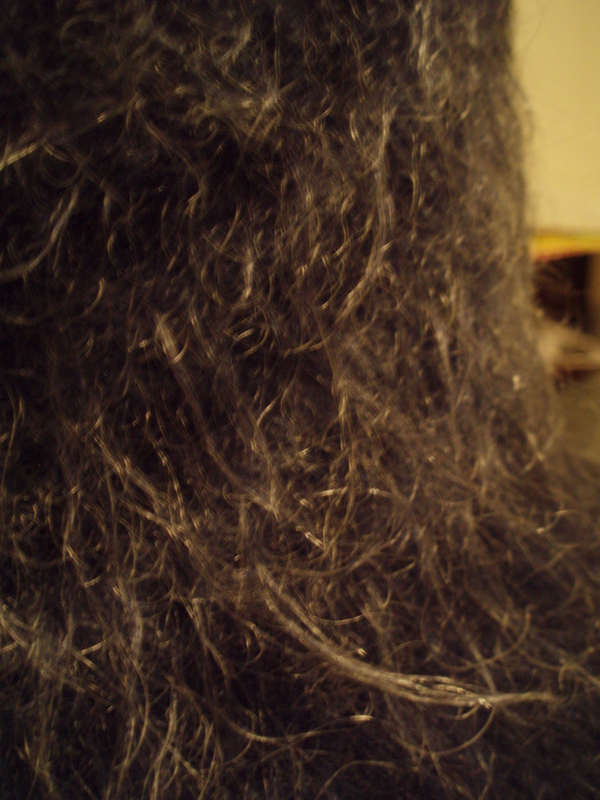 I deemed it necessary to trim off the extra fuzz. 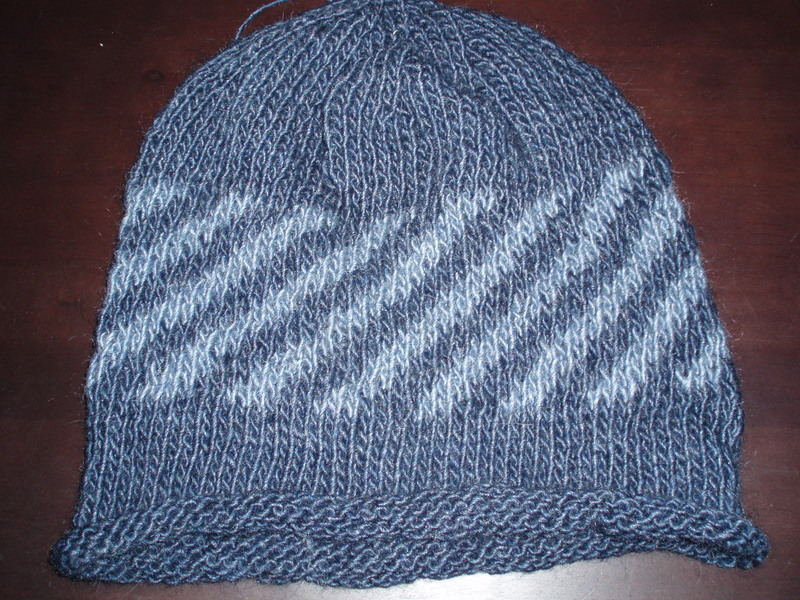 Modifications – The pattern calls for three colors but I only used two. I actually did the colored part using my left hand for one color and my right for the other. 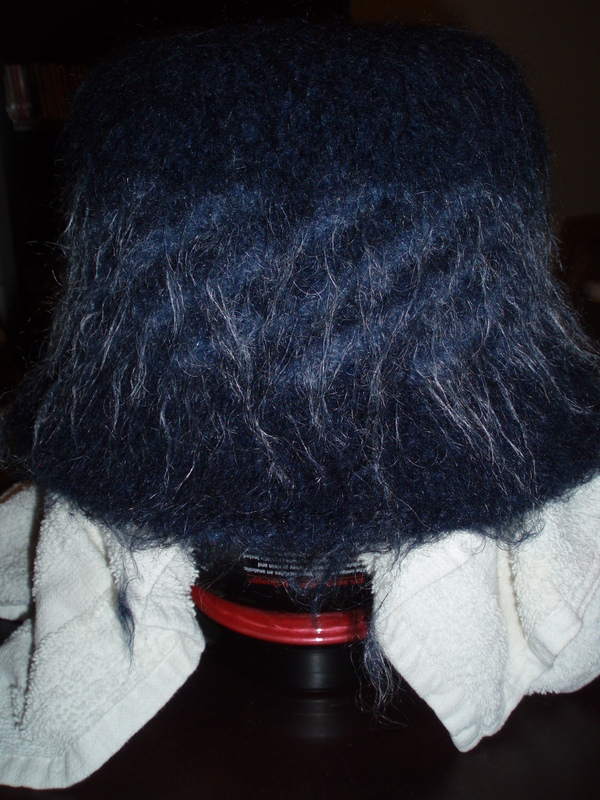 It was great because I knew I was felting it so uneven stitches were no big deal. I think it was the perfect warm up for the fair isle type sweater I want to knit soon. I have worn the hat twice now and I think I may actually have an acceptable hat. The only problem is it doesn’t fit very well over a pony tail. Oh well, there is always next time. 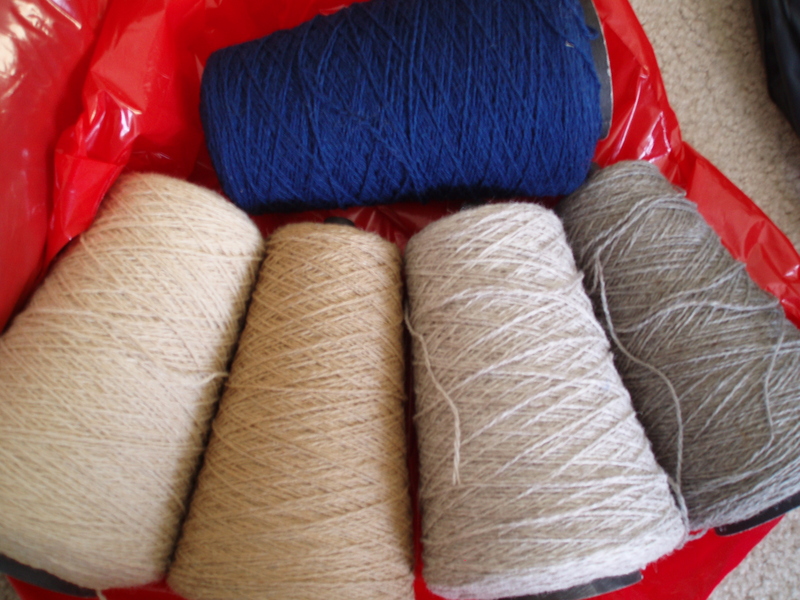 I think that I have mentioned before that I try to buy yarn for myself only 2x per year. The Yarn Barn has 2 sales a year and those are the times which I choose to spend almost all of my yearly yarn budget. I only bought one sweaters worth of yarn at the July sale. Depending on how you count it I bought enough for 4-5 sweaters at the year end sale. That is the Cascade pile. 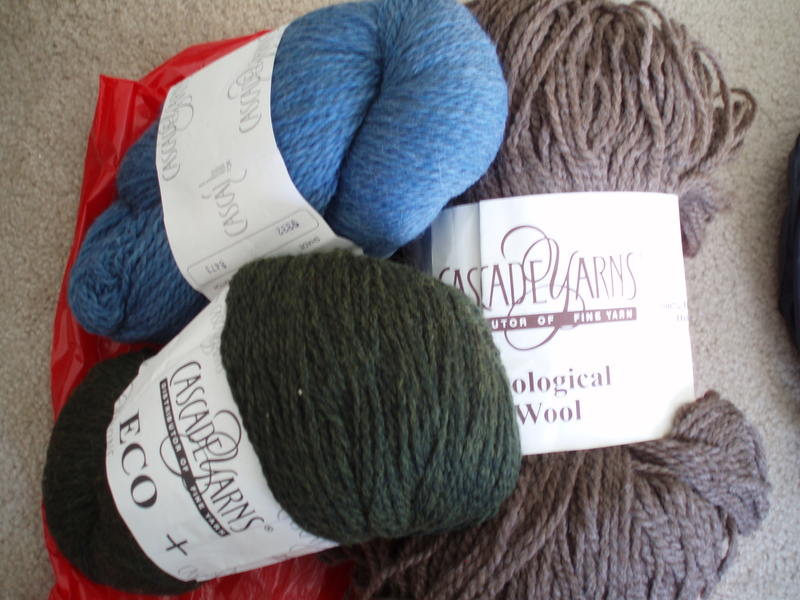 The blue and green are Eco +, which will be sweaters for my two nieces. The brown Ecological Wool is for a sweater for myself. I have loved this yarn since I first saw it and now I am really excited to make something out of it. It is a nice bulky weight with 478 yds per skein which means that I think I will only need 1 for each little girl sweater and 2 for myself. This is Harrisville Shetland. The yarn when sold on cones is meant for weavers but after washing it blooms really nicely. I have dreamed of a color work sweater for a while now and this will be the yarn I use. I bought the smallest cones they had but will have a decent amount left over. Lucky for me the red sweater I am currently making is also out of this yarn, so the leftovers can all be combined to make something else. I am thinking a vest or another sweater if there is enough left over. Now I need to start knitting faster. When we were kids there was nothing we looked forward to like a snow day. In WI there needs to be a lot of snow to keep people home but here in KS thankfully 5″ was enough. I had very little to do at work yesterday and was sent home early because the snow had started. As I was leaving my boss mentioned that if the roads looked bad there was no need for coming in today. I took him up on the offer. I am home and warm and will hopefully not have to clean off my car until tomorrow. I am extremely grateful to the nice people who are selling the house next door because they used their snow blower to clear my sidewalk too so I don’t even have to shovel snow. On to knitting. About 6 days before christmas my boyfriend requested a knitted hat to give as a gift to his sister. He thought is was something she would really like (I am not so sure but we shall see, snow storms have prevented the gift from being given yet.) It was a good excuse to go yarn shopping and I took it. I purchased some worsted weight machine washable wool in a nice medium gray (hopefully it will match something she has.) I went to ravelry and my boyfriend picked the hat pattern, I had already narrowed it down for him to 4 different patterns that I was actually willing to make. I am really pleased with the result. 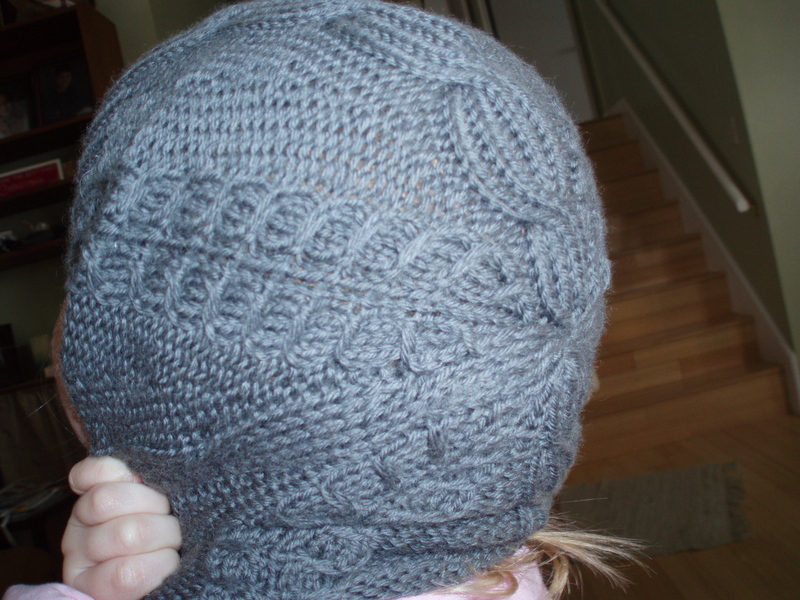 Modifications – I actually knit this pattern Almost exactly as written. I changed the increase round between the ribbing and cable section to flow more nicely into the cables. A blurry photo (she wouldn’t quit moving) of my very cute model. The back of the hat. I did not do a gauge swatch and the smaller needles I started with made the ribbing too tight so I went up a needle size. Luckily only one because this yarn expanded in the wash. I hand washed the hat so I am not sure what the washing machine will do to it. I was not smart of enough to measure it at all so I have no idea how much it grew. Hopefully it will be given away this weekend and actually worn. If not I want it back because I really like the hat. I am sorry for the gap in posting but holiday time is always a busy time. I got to spend a lot of time with my family and I have been slowly switching back to my regular schedule. I have lots of pictures of my nieces, the yarn haul from this year’s sale and a couple knitting FOs to show off. Today will be for the latest baby item I finished. Modifications – I finished the legs with 3 rounds (I think?) of purl instead of knit and I used a knitted i-cord instead of a crochet chain for the draw string. I have seem many cute pictures taken of teddy bears wearing baby items. Well, for me it did not work out. 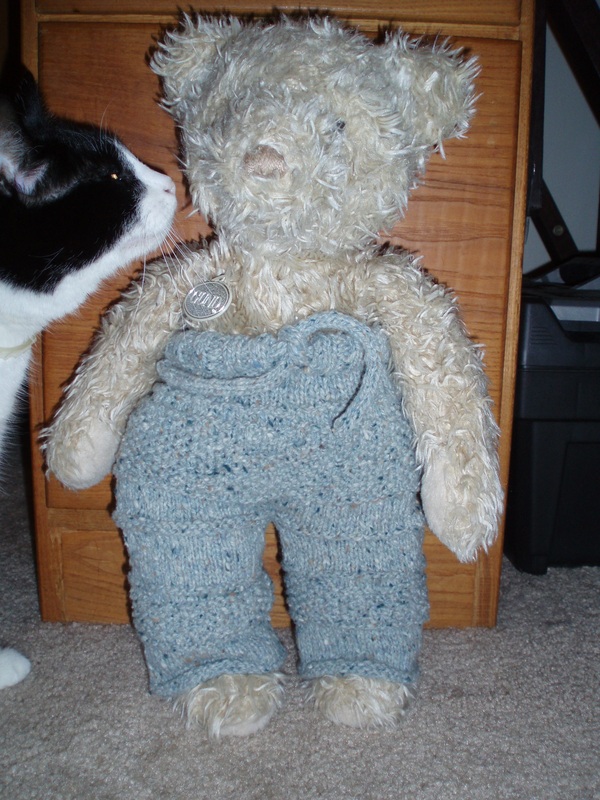 My bear is a grandpa with his pants up to his arm pits.